Ho Chi Minh cheffed here! 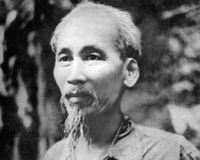 Revolutionary Ho Chi Minh trained as a chef here in 1913. Description: Vietnamese revolutionary Ho Chi Minh trained as a chef here in 1913, when the prestigious Carlton Hotel stood here. It was destroyed in the blitz and is now New Zealand House. It's believed that while he was working here the hotel catered for Winston Churchill and David Lloyd-George.